INTRODUCTION TO COMPUTER ART: This is a class about the Power of Communication; an opportunity for students to learn to use that power. WHY COMPUTER ART? Whatever path you take in life these skills will be useful. I recently ran into a former student who told me she worked for a hotel chain. Then she went on to explain that — thanks to the skills she learned in my class — she re-did the signs for the hotel, created a new brochure, and regularly updated their website. She told me her boss was very impressed. BTW: In the course of this year, I'll give you credit if you create an animation for your mom's birthday card or a flyer for your church bazaar. WHAT IF YOU'RE NOT AN "ARTIST"? It's funny. Ask a kindergarten class who's an artist and almost all the kids will raise their hands. But by the time those same young people enter high school, it's very different. So be creative! Express yourself! Have fun with the assignments! WHAT IF YOU DON'T HAVE A GOOD EYE FOR DESIGN? This is a more valid question than the one above. The answer: Make up for it by putting in effort. Don't just settle for the first thing you slap down on the page. Experiment with filters, move around text to find the best position, spend extra time being precise with cut outs. And follow instructions! DREAM: Each student will download an online picture of Dr. Martin Luther King, Jr. They will combine this image with one word "Dream" and then consider what they've created. One image plus one word — but it communicates something more. If you don't get it, the teacher will show other examples of different images with the single word "Dream." GALILEO BANNERS: Combine text with an image of a lion using school colors to create one banner for the football team, one for a business card, and a third. FIRST NAME BANNERS: Adjectives can be used to describe people and also to describe design. Students will create three banners with colors and designs reflecting their selected adjectives. 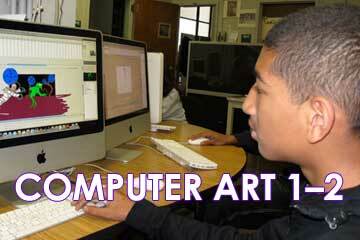 LAYOUT: Students will duplicate the layout of a formally-designed page with strict alignment and spacing (Typography). Then students will create their own creative layouts for another page (20th Century Artists). PHOTOSHOPPING: Students will complete exercises to get experience using the Lasso Tool (Windows) and the Clone Stamp Tool (Courtyard). Then students will use these skills to create Photoshopped images combining landscapes (Imaginary Landscape) and combining people (Twins Project). PHOTOSHOPPING2: With Put Yourself in the Picture students combine images of themselves with other pictures, placing themselves alongside famous people or in exciting locations. Work is graded on the care and precision in using the appropriate Photoshop tools, but also on how realistic the finished product looks. Students will be able to choose from a list of artists for their research project. Each student will answer a series of questions/topics about their artist. Each question will then be the basis for one page of a PowerPoint presentation. What important factors shaped this artist's life? What did critics or art historians say about this artist? What is your opinion? What do you like? What do you dislike about the artist's work? WRITING FOR POWERPOINT: Selecting the most important information and then expressing it in clear, concise ways is an important skill that students will need in college or in any future careers. ORAL PRESENTATIONS: This is another skill that's important for college or work. It's a challenge for certain students, but all the more reason it's important for each student to meet that challenge (and for students to be attentive and supportive when their classmates are presenting). ART APPRECIATION: Just as students in high school learn to appreciate great literature and become familiar with famous writers, this project introduces the class to different art movements and some of the creative people who've influenced the visual style of the world around us. BOOK COVERS: Design three different covers for a book you read in English class either this year or last year. The finished products must be monochromatic (one color family). 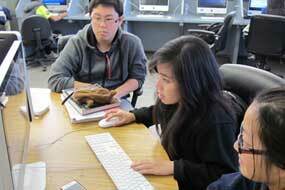 SPORTS FRANCHISE: Students have been hired to create logos and then ads for a new sports franchise in the Bay Area. Students can select which sport and create their own team name. MOVIE POSTERS: Each student will create a movie idea and select two stars (who have never been in a movie together). Then they will design a series of three posters for their movie. CD COVERS: The CD will be a duet between two stars who have never worked together before. Students will name their CD and design three covers. Then they will choose one of those covers and create a poster for the summer tour and a simple monochromatic design for a baseball cap. FUNCTIONAL DESIGN — MONEY, FLAG, STAMPS: Students will consider the functional uses of a nation's money, flag and postage stamps. Then they will create their own country and design these different products. FACE ANIMATION: Students will create a face with two eyes, two eyeballs, two eyebrows, and a mouth. Students will learn to create one library symbol and use it on more than one layer. They will also learn that the mouth cannot be a library symbol, but must use a Shape Tween. FALLING LEAVES: Students use vector graphics tools to create two different leaves. Each leaf will be used on three different layers, each with keyframes. Students will experiment with the transform tool in changing scale, rotation, and skew of the leaves. NAME ANIMATION: A fun diversion. Make the letters dance onto the screen, spin, twirl, change colors, and end with a name logo. ROLLING WHEEL: Students will create a movie clip symbol of a wheel rotating 360-degrees. Then this symbol will be used on different layers to create a scene showing movement two ways — foreground moves against the background, then background moves against the foreground. GALILEO FOLDER COVER: Each student in this class will create a design for the Galileo folder cover. Student officers will select which folder cover design to use for the following fall. GALILEO AD CAMPAIGN: Each student will create a series of three ads for Galileo. These ads should work together cohesively as one ad campaign. AUTOBIOGRAPHY BOOK COVER: Each student will create a title for their autobiography (life story) and will then design three different covers for that book.